Andorra is a lovely and tiny independent principality in the Pyrenees, sandwiched between Spain and France. With a surface of 468 km2, it is one of the smallest microstates in Europe, with a year-round population of just 75,000 inhabitants. But while small in size, in 2016 Andorra received more than 8 million visitors drawn by winter sports, summer climate, duty-free shopping, and a wealthy international commercial and banking sector. While many visitors come for leisure, a growing number come for business. One of the key backbones to Andorra’s successful competitive business environment is its high-performance telecommunications infrastructure: 98% of homes and business have access to broadband Internet and 100% get these services through optical fiber networks. But with both visitors and residents demanding more bandwidth, Andorra Telecom faced an important question: How do they stay ahead? Andorra Telecom realized quickly at the beginning of the 21st century that digital video was a reality. Streaming video through the Internet would require moving from existing infrastructures to newer ones that could handle higher than average rates per subscriber. At that time, Ethernet Passive Optical Network (EPON) and Gigabit-Capable Passive Optical Network (GPON) were being standardized, and both were valid options to solve bandwidth requirements in the access network. Because EPON arrived earlier into the market, Andorra Telecom used it as a competitive advantage, to become one of the first countries in Europe to reach 100% coverage with FTTH technology back in May 2010. Andorra Telecom then deactivated its DSL network, making it the first country in the world to claim an all-fiber broadband footprint. The main difference between EPON and GPON is from a standards perspective. The IEEE defined EPON, while the ITU-T defined GPON. Both are built to be exploited for a long period of time and assure a high availability of services at any time. However, EPON was defined from the perspective of a corporate IT manager, while GPON was defined from the perspective of a telecom operator. The two perspectives are quite different. GPON standards from a telecom operator perspective were built on the premise that the network must meet customer demands for service availability 24 hours a day, 365 days a year. The initial EPON specifications didn’t contain a common management protocol for this level of performance, which led to proprietary implementations (a shortcoming the IEEE did address later through development of a common platform). The telecom operator perspective is why in the field GPON registers a lower number of incidents and allows co-existence with such next-generation PON technologies as XGS-PON and NG-PON2. These characteristics are key for a new telecom network deployment to be profitable, making GPON management better at addressing telecom operators’ requirements. Along these lines, Andorra Telecom decided to migrate from EPON to GPON because of the way optical network units (ONUs – the EPON units at the customer premises) were managed. GPON offered more reliability for continuous service; opex is lower than in EPON networks as well. The explanation for this discrepancy is that in Andorra Telecom’s EPON network, the devices at the customers’ homes stored the configuration in internal memory. In GPON, the optical line terminal (OLT) in the central office reconfigures (if necessary) the customer premises optical network terminal (ONT, the GPON version of the ONU) every time it is started. In Andorra Telecom’s EPON implementation, if there was an update in the configuration and the device at home was turned off, that update was not applied and incidences began to occur. In GPON, it does not matter if the device is turned off or on periodically; when the device is turned on, the OLT checks how it is configured and updates it in case it is necessary. Another concern for Andorra Telecom was the ability to provide all services using the same telecommunications network. This is possible in GPON, which was designed to optimize triple play: voice, video (digital and analog), and data services for homes and businesses. Some key benefits include the reliability of the point-to-multipoint architecture common to PONs, so that information sent from one point reaches all end-points. And GPON offers a smoother channel surfing experience. As Andorra Telecom discovered, a GPON architecture uses time-division multiplexing, where media access in the downstream is based on service ports that can be shared among users. This means that when several users in the same neighborhood are watching the same TV channel, the overall bandwidth consumed is not a factor of the bandwidth consumed by a single viewer. In traditional telecom infrastructures the same video stream being sent by multiple viewers watching the same channel consumes more bandwidth. But in a GPON network, a common multicast channel carries the traffic being consumed at one specific moment by all the users in the same network, and each multicast flow is sent only once. Why is this important? Because at one edge of the access network, the OLT only forwards towards the end users the TV channels being consumed and, at the other edge, the ONT located at the customer premises, is the device that controls sending the channel that is being consumed by the TV viewer and blockingthe ones being consumed by other users. Thus channel surfing or otherwise switching channels quickly does not impact the bandwidth consumed in the network if that channel is already being watched by another TV viewer. The new multicast flow is already being transmitted in the common multicast channel and the ONT just has to block the previous channel and forward the new one. (Figure 1) The result is more efficient use of bandwidth and ultimately a better viewing experience, especially for those of us who tend to change the channel a lot. Figure 1. Bandwidth savings when several viewers watch the same channel. GPON offers a more efficient and dynamic way of providing bandwidth governed from the OLT, the device at the operator’s site. In unicast services, such as Netflix (Internet), GPON provides the mechanisms for the OLT to dynamically learn how much bandwidth each service requires. This way, if there is bandwidth assigned to a user that is not using it, the OLT is able to react and make this bandwidth available to other users that may require it. All this dynamic bandwidth management is done from the OLT according to the service-level agreement contracted by the customer, ensuring maximum network performance. In multicast services, like broadcast TV, Internet Group Multicast Protocol (IGMP) filtering is used as the mechanism to serve or block IPTV channels on demand, allowing the network to distribute data to multiple recipients. Using multicast, Andorra Telecom can send a single copy of data to a single multicast address, which is then distributed to an entire group of recipients. How is this done? Which video streams are sent through the network from a multicast source depend on upstream IGMP Join/Leave messages. When a TV viewer, using the remote control, zaps from one channel to another, this action results in an IGMP Leave of the previous channel, and an IGMP Join to the new one being sent in the upstream direction. The routers, on the way to the multicast source, receive these messages and filter, or allow the multicast flows to be served through their ports. This way multicast streams do not flood the network unnecessarily, which enables more efficient bandwidth management. In December 2017, Andorra Telecom announced that they successfully completed the overhaul of their fiber-to-the-home (FTTH) network, replacing all 35,000 end-user ONUs with ONTs in just 229 days. As a result, all customers are now able to access downlink transmission speeds of up to 300 Mbps. As they continue to work on optimizing the network, the early results are promising. In early lab tests they have been able to separate the IPTV traffic (IGMP basically) from the rest of the services in uplink. The functionality of their ONTs has the potential to continue to improve network productivity as they roll out services and infrastructure further. Andorra Telecom is a prime example of keeping telecom infrastructure up to date with demand. GPON architectures improve efficiencies in broadcasting and high-bandwidth triple play networks, offering valuable lessons for fiber deployments of any size. Maria Alejandro is co-founder and global lab manager at GPONDoctor. With 20 years in the telecom industry in research, design. and development, she is an expert when it comes to optimizing last-mile quality assurance and OMCI, GPON’s ONU management protocol. She works closely with customers, including the world’s leading telecom providers, to deliver a better user experience for FTTH networks. La agencia vasca de desarrollo empresarial, SPRI, del Eusko Jaurlaritza-Gobierno Vasco nos ha hecho el honor de publicar en su blog un interesante articulo sobre GPONDoctor. NetComm Wireless (ASX: NTC) has extended its agreement with NBN to supply a world-first product – the next generation of Reverse-Powered Distribution Point Units (DPUs), known as High port count DPUs. Provided in 8 and 16 port variants, the new reverse-powered High port count DPU will enable nbn to extend the Fibre to the Curb (FTTC) network to higher density installation locations, such as multi-dwelling units, where bundled copper lines are prevalent. Advanced interference reduction technology (vectoring) is supported in the NetComm High port count DPU, which combined with Gfast (fibre-like speed) capability, facilitates maximum throughput speeds to the connected premises.Having a higher port count DPU that has reverse powering functionality reduces the overall solution cost and substantially simplifies deployment for the operator. The agreement extension builds upon NetComm’s current position as nbn’s supplier of 4 port DPUs. NetComm CEO and Managing Director Ken Sheridan said the solution is likely to gain traction in other global markets, particularly the UK and Europe, as it provides the missing link between running fibre down the street and delivering a Gigabit service into premises. High port count DPUs are part of NetComm’s growing telecommunication infrastructure equipment and IIoT provider business. Other business lines include Fixed Wireless, NCD, IIoT and Machine-to-Machine solutions. In FY18, NetComm’s telecommunication infrastructure equipment and IIoT revenue increased 81 per cent to $156.5m, accounting for 86 per cent of all revenue. This is a fundamental change for the company, which has previously been more dependent on its consumer broadband business. The nbn agreement extension contains an initial minimum order commitment of 10,000 High port count DPU units within a period of 18 months following the satisfaction of certain conditions. NetComm expects initial deliveries of the devices to nbn to occur later in FY19, subsequent to the satisfaction of these conditions which include nbn’s customer acceptance procedures and normal regulatory approvals. Spain is the leading country in fiber deployments in Europe, with a 33.9% of FTTH (Fiber To The Home) penetration rate, after joining around 1.61 million new subscribers between 2016 and 2017, according to a report commissioned by the FTTH European Council, formed by more than 150 companies. But, how is the User Experience in FTTH offered by telecom providers in Spain? MedUX, which is currently retrieving fixed broadband User Experience metrics, has detected a notable experience in FTTH services. 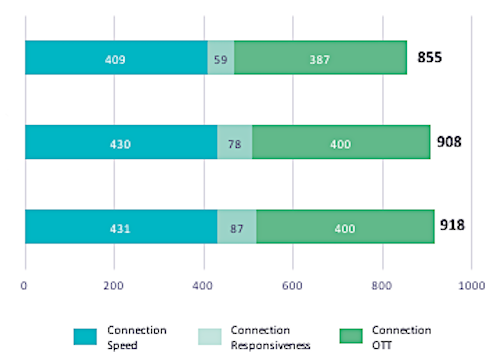 Our May report on the Fixed Broadband Network Status in Spain, which covers three leading operators in the country, reveals that the performance and experience provided by Spanish FTTH providers is remarkable and it has a consistent behavior. This strong network performance is defined by a high connection speed, above all for upload and download speeds; a progressive network responsiveness evolution and a potent OTT (Over The Top) service performance (based on Web, Dropbox and YouTube metrics tests). If you are interested in knowing more or you want to receive a copy of the ‘Fixed Broadband Network Status in Spain’ report, please contact info@caseonit.com. Ireland appears on the FTTH Council Europe’s FTTH/B leaders list for the first time. The UK remains conspicuous by its absence. IDATE, working with the FTTH Council Europe at the latter’s FTTH Conference 2018 in Valencia, Spain, last week, reported that the number of subscribers in Europe served via fiber to the home/fiber to the building (FTTH/FTTB) networks increased 20.4% between September 2016 and September 2017. The increase in subscribers came as take rates on the continent among EU39 countries grew from 29.2% to 34.8% over the same time period. The number of homes passed among the EU39 countries also expanded, to more than 148 million. The figure represents a 16% climb over the study period. Russia led the way to FTTH/FTTB subscriber growth; the country added 1,826,000 FTTH/FTTB subscribers in the 12 months ending September 2017. Spain (1,612,371 new subscribers) and France (an additional 1,067,780 subscribers) also enjoyed significant upswings. Private network operators are jumping into FTTx deployments in a big way; 56% of FTTx network operators in Europe fall into this category, according to IDATE. Meanwhile, the Fiber to the Home Council Europe updated its list of FTTH/FTTB deployment leaders among European countries. Latvia remained in the top spot, with a 50.6% penetration rate (see figure above). Ireland joined the list for the first time with a penetration rate of 1.7%. Countries must have a penetration rate of at least 1% to be included in the tally. The figures in Europe track with those recently released for North America, where FTTH new builds reached record levels during the same 12-month timeframe (see “U.S. FTTH deployments set record: Fiber Broadband Association”).